This is an update for my earlier post Facebook Photoshop Templates. 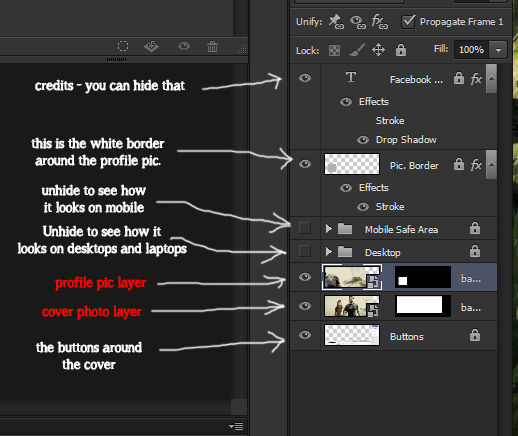 I have created a new Adobe Photoshop Facebook Cover Template with an option to check how it will look on mobiles. 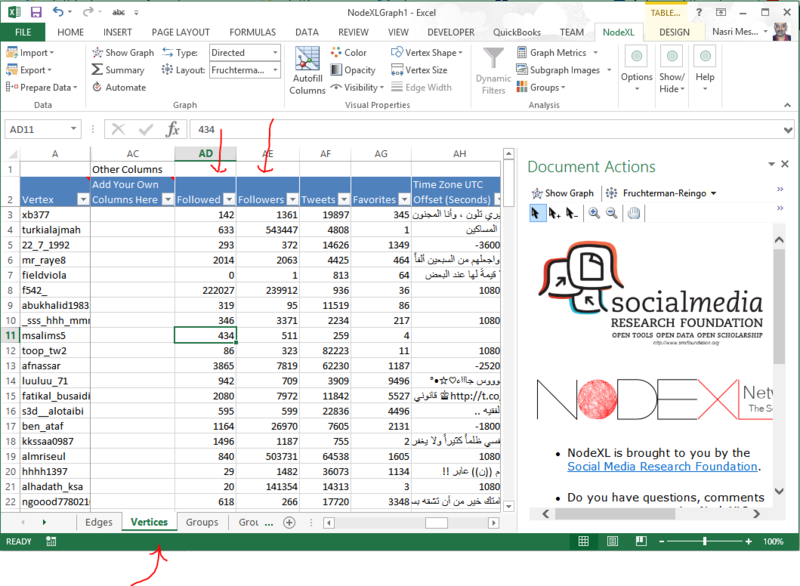 In this post, we will consider analyzing the Arabic hashtag with NodeXL. If you’re searching for a Latin string or hashtag, go directly to step 3. 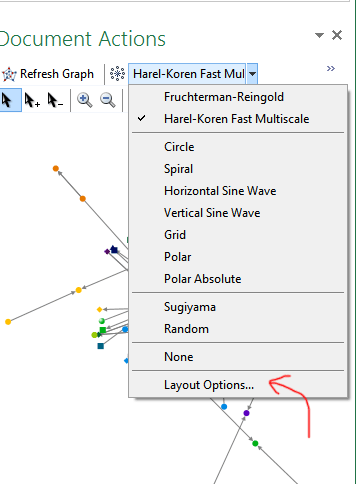 1- On some computers, searching for an non-Latin string may cause NodeXL to return a null result. 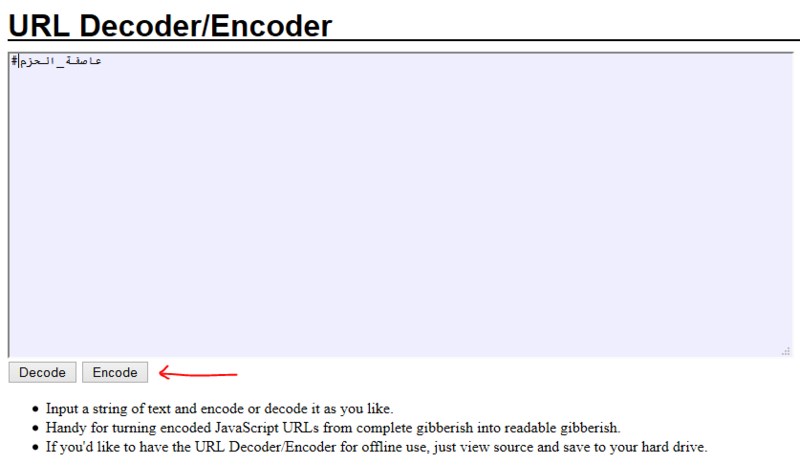 The safest option is to convert the Arabic string to URL code. Several websites offer a conversion tool. 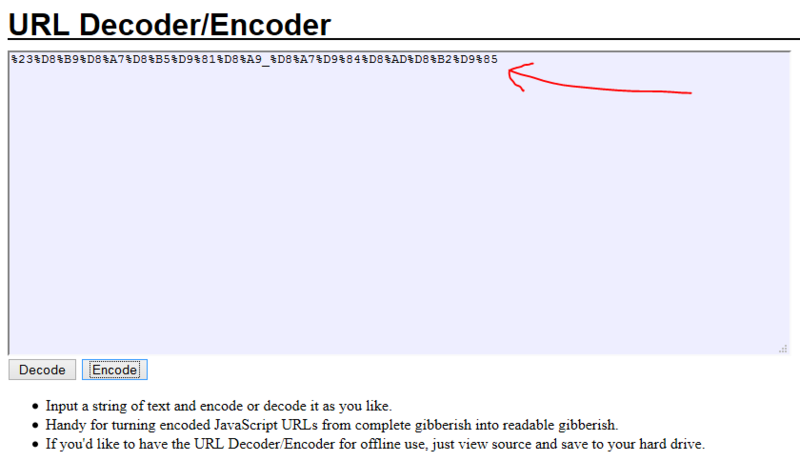 Look for “URL encode decode” on Google. 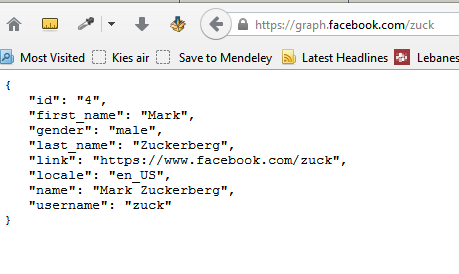 We will use the following website: http://meyerweb.com/eric/tools/dencoder/. 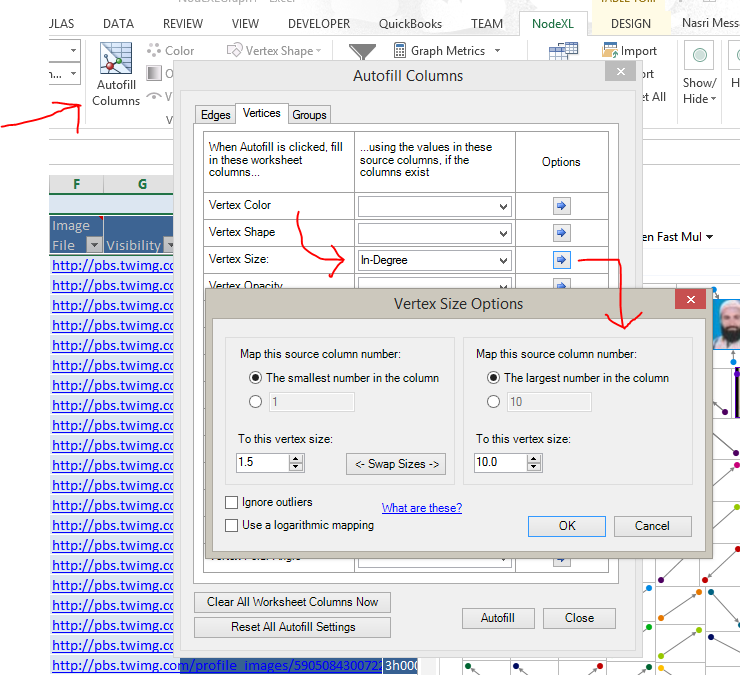 4- Paste the code from step 2 in the search box. You may want to limit the number of tweets (in this example, we limited the number of tweets to 1,000). 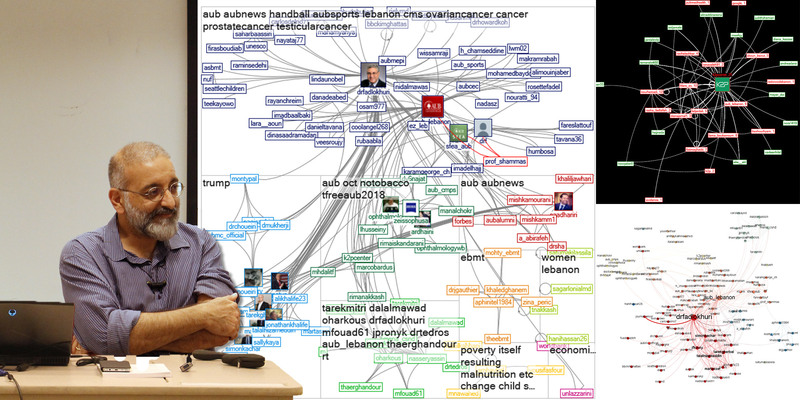 Note that you may need authorize NodeXL to use your twitter account if this is your first Twitter analysis. In its current state, the graph doesn’t say much. 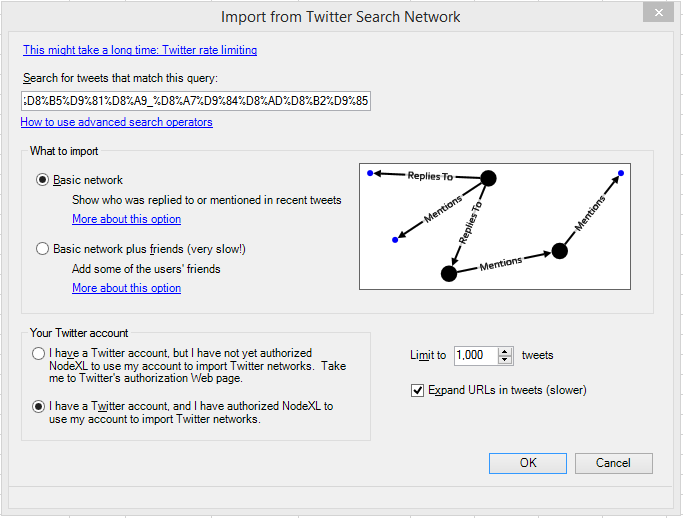 Yet, it can give you an idea of the structure of the network and you can mouse-over the vertices to read the tweets and the mentions. We will improve the layout in the next steps. 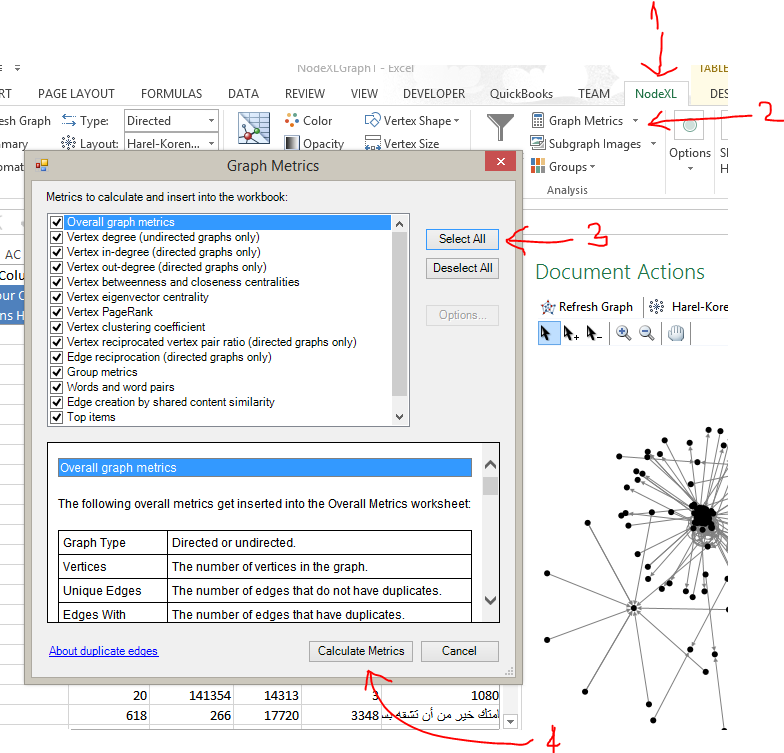 7- In the NodeXL ribbon tab, click on “Graph Metrics”. 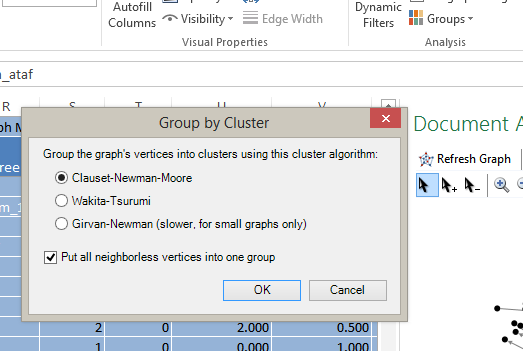 Then, “Select All” and “Calculate Metrics”. 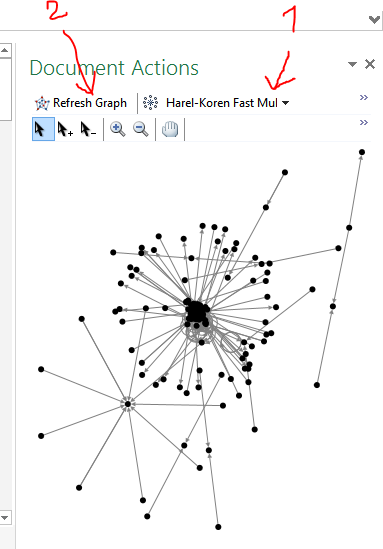 8- The data compiled can be used to analyze the network and its characteristics (outside the scope of this article which is limited to retrieval and display). 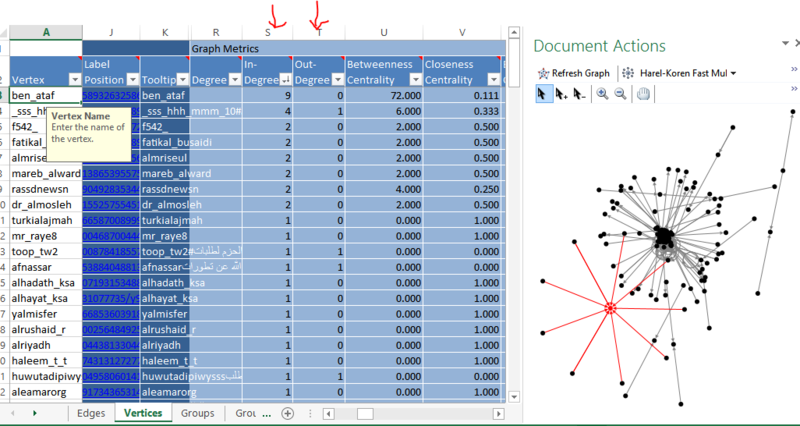 Note, that in the vertices sheet, the “in degree” represents the number of times the tweeter was mentioned and the “out degree” the number of times he mentioned someone else. 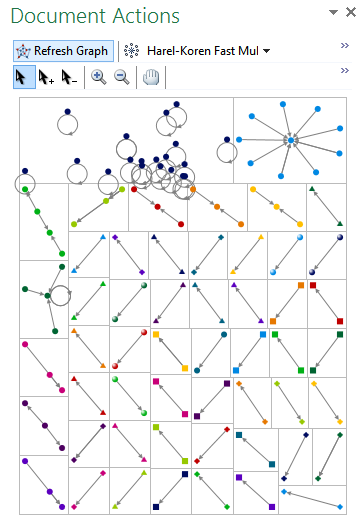 Note the Groups and Group Vertices worksheets. 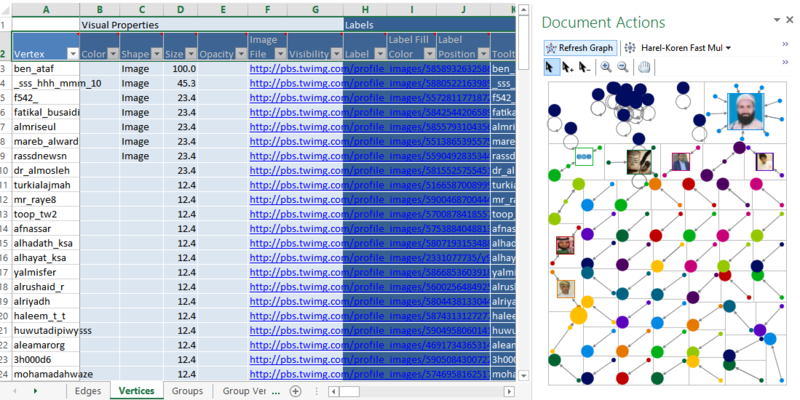 12- To display images instead of dots, in the vertices sheet, select “image” in the shape column, go to the NodeXL tab in the ribbon, select group, group options and check “the shapes specified in the shape column….” to use the shapes defined in vertices sheet instead of those defined in the Group Vertices sheet (this also works for colors). 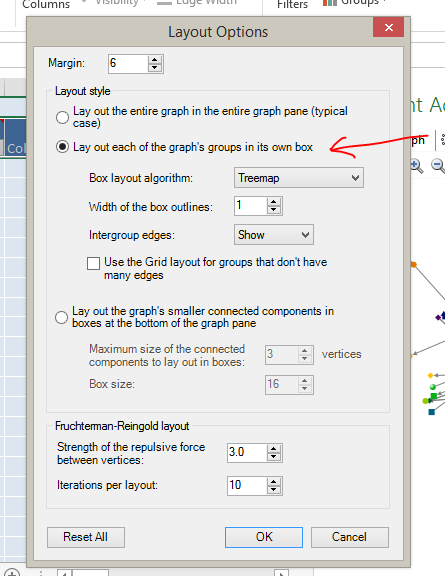 Note the size and opacity options you can also use to improve the layout. 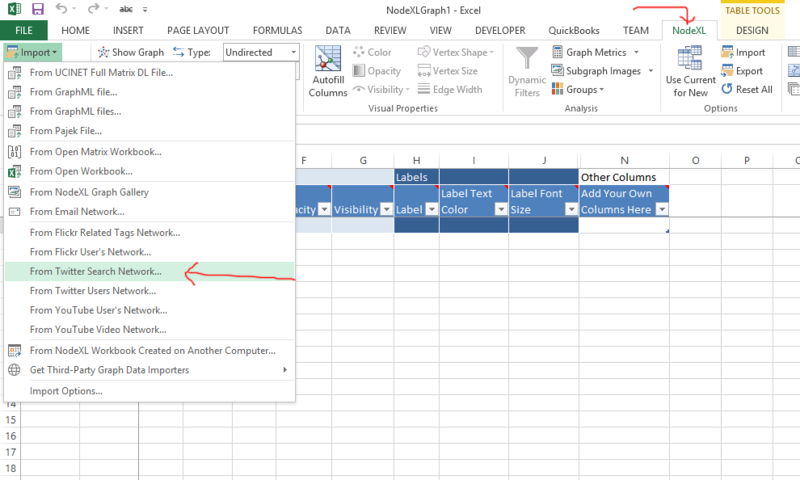 13- The Autofill option allows you to quickly fill a column to modify the layout of your graph (note that you need to refresh the graph to see the results). Try to change the shape, opacity, etc. 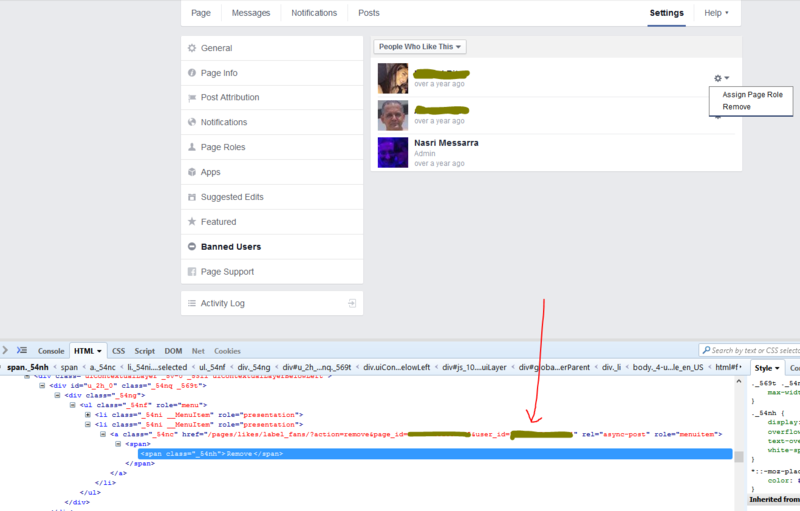 A Facebook troll is someone who posts aggressive comments on your page – often immediately after you publish a post – in an attempt of creating a firestorm of controversy. 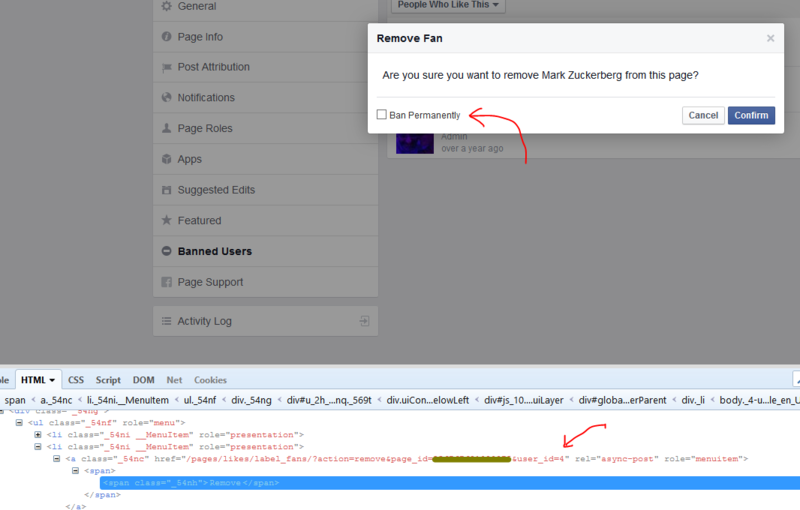 Most often, these trolls do not like the page and it becomes impossible to ban them or stop them using the straightforward ban user function provided by the Facebook interface. 3) Click on F12 or Ctrl+Shift+C to inspect the page (depends on your browser. Works both with Firefox and Chrome).